Since we didn’t have internet to do a little research on what we wanted to do with our full day in Tassie we had to just make a choice. 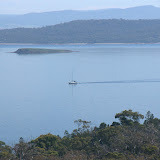 We knew before coming here that Freycinet National Park was supposed to be worth a visit but we didn’t have a lot of information about it. Our GPS said it would be a 3 hour drive which sounded like a lot but why not give it a go. We got up early and headed out of Hobart. It was a nice sunny morning with another nice sunrise. 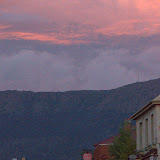 The sun comes up about 20 minutes earlier in Hobart than it did in Melbourne. The drive was filled with a lot of road kill. There were a lot of dead Wallabies. You have to drive slower between dusk and dawn because of the animals. We did see an echidna walking along the road. We went to the visitor center and got our map and paid the park fee. We also forgot our bug spray so we had to buy another bottle. We also were shocked to learn that to see the bay that we just drove 3 hours to see was going to be a 3 hour hike. You could hike for an hour and half to see the lookout. So not only did we not have our bug spray but we weren’t prepared at all. We didn’t have a backpack or food. Luckily we did bring a large water from the mini fridge in our apartment and 6 little pieces of Cadbury chocolate. There was no turning back though and we set out on the hike. To the lookout is 600 stairs. There were plenty of older hikers on the trail. They usually wanted us to pass as they were taking their time. Impressive that they were doing the hike at all because it was a pretty hot day. Our plan was to hike to the lookout and then decide if we should hike to the beach. The beach was named one of the top 10 beaches in the world so I wasn’t sure how I would be satisfied not going down to the water. Our decision was made for us when we missed the sign for the lookout. An older couple let us pass and onward we went on missing the sign. We started a steep decline down rocks. We were wondering how all of those people were going to do this hike. It took us awhile to realize we must have taken a wrong turn. The hike to the beach is a must!!! There are no disappointments when you get on the sand. The sand is like little perfect pebbles and there was a wallaby at the bottom to greet us. I would have stayed down there all day if we would have had some food and more water. The hike back up wasn’t as bad as I thought until I saw a huge snake. Luckily it went off into the forest so I didn’t have to scream. No photos of the snake as I was frozen. There were some crazy people doing the hike down. One was an Aussie on crutches with a huge walking cast on. Maybe he didn’t think the difficult hike was that hard. The photos don’t do this hike justice. The sun was so bright it really washed out the colors. Wine Glass Bay is worth another visit for sure some day (and maybe I will be prepared). Click on the photo to view the slideshow. The flight was easy…maybe too easy. We never had our ID checked or anything. You do go through security but everyone can go through there. People were able to meet people at the gate. They had dogs check our bag in Hobart when we got off the plane to make sure we weren’t bringing in any quarantined items. They do use the cutest dogs. I thought it was pretty impressive watching the dog walk on the baggage as it was going around the carousel. We got our car and drove into Hobart in search of our apartment. Once we checked in we had to head out and get dinner as we were starving. We walked around in search of dinner. Fish and chips are everywhere. We finally decided to try the Indian restaurant though, and it was fantastic. Honestly, if you are seafood lover, Hobart is the place for you. 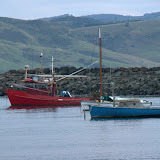 We could see the fish coming off the fishing boats and ready for sale. Oh and by the way we didn’t have internet so I’m a little late in posting all of this. We have been packing as much in to our days as possible which means we are usually trying to get out the door by sunrise. We decided to go for a walk as the sun was rising over Apollo Bay. I’m glad that we did because we saw a fairy penguin swimming in the bay. Actually at first I thought it was a injured bird because I have never seen a penguin in the wild but after researching it on the internet we determined it was in fact a fairy penguin (aka little penguin). I think I got a pretty good photo of it swimming. I decided to walk out on the boat dock. It was pretty hard to stand on the dock because it was bouncing back and forth. I was standing at the end of the dock trying to get a photo of the fish in the water when I saw something huge come out from under the dock. Once it was all the way out from under the dock I realized that it was a huge sea creature. I’m not very good at identifying animals that I don’t see all the time but I think it was a sting ray. I got a little uneasy at staying at the end of the dock since it seemed like it was starting to circle me. After a couple of photos I made my way back. We drove back to the Melbourne Airport for our flight to Hobart in Tasmania. The drive was pretty easy besides being behind some very slow drivers. I had to fill up the car. We only used half a tank of gas (thank goodness for renting a hybrid). Half a tank of gas costs me $50. Today was our full day to explore the great ocean road and I couldn’t have asked for anything more. My eyes were completely amazed at how beautiful this coast is. The red rock and the green plants next to the red sand and blue water. What more could I ask for? 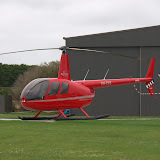 Wait did I hear a helicopter tour of the twelve apostles? Yes, you heard me correct. I even got to wear the fun ear protection and microphone. For a small price more we could pick a low flying helicopter. Why not fly closer to the rocks? Our helicopter could also land in the water if necessary but I’m honestly not sure how it would survive the powerful waves. We had to wear life vests. Not sure if that made me confident or not. We had to leave everything behind except a camera. They weighed us and we were off to the heavens. We left Melbourne for Apollo Bay. 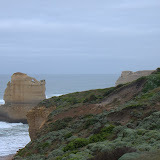 The route was Great Ocean Road. I managed to not have to do any “hook” turns in Melbourne so I was pretty happy. 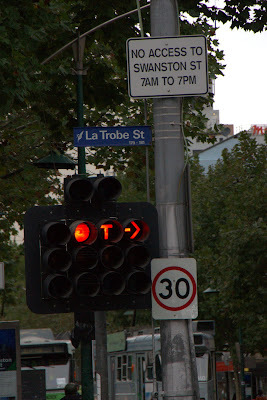 The photo below is of a street light in Melbourne. We drove the scenic route which also include a bike race. I was just thankful the bike race was going the opposite direction of me but the 4.000 riders were with us for 40 km of our drive. We did stop a couple of places along the way for photos. I was really hoping to see a kangaroo but haven’t spotted one yet. You would think that since Hertz told me if I hit a kangaroo it would cost me $2,200 that I would have seen one by now. The biggest challenge to the drive was when we were going down the highway and the bikes were coming at us the opposite a direction and a dog got loose from a yard and ran straight at my car. It was ultimately chasing the bikes but boy was I worried about the dog. I was able to stop in time, and I saw people come running out of the yard after their dog. I’m just going to assume the dog is safe. It is very helpful that there are plenty of signs that remind drivers to drive on the left in Australia. If only I could remember that the turn signal is on the right side of the steering wheel and not the left. I turned the wipers on more times than I can count. I also reach for my seatbelt over the left shoulder when it is really on the right side. I’m getting a hang of it though. 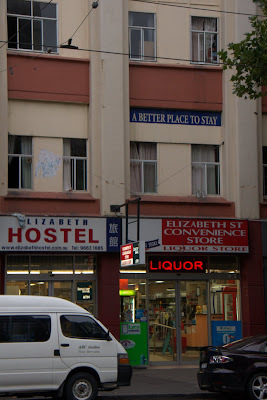 I know I have grown up when I say I’m too old to stay in a hostel. Our hotel is across the street from a hostel. Or should I say our hotel is across the street from a liquor store. Well it is both. In fact the hostel reception is in the liquor store. I can only imagine what the inside of this hostel looks like. Besides the botanical gardens and the aquarium we rode the free tour bus to save our feet some. We took it across town to the Italian community for some lunch. We tried a pizza with ham, bacon, egg and cheese. They called it Aussie so we thought it was something authentic. It was decent and felt good to get some real food in us. Still not healthy so I guess we better walk some more. We found a foreign language bookstore. It was amazing how many books they had in German. It was also amazing how much they charge for the books. The same German course book that I bought in Vienna last year was about 20 dollars and here it was closer to 50. So I didn’t buy any books but it was fun shopping. It also was good I didn’t buy anything since, I have no room in my suitcase because of the airline weight limit. I was only 1 pound short on the way over here. As we walk it is pretty fascinating to watch the traffic. They drive on the opposite side of the car and road. To make a right turn you get in the left lane and stop in the middle of the intersection in front of the cars going in the direction you are turning. Once your light turns red you then make your turn. We will see how I fair at making a “right” turn tomorrow when I get in a car and drive down the Great Ocean Road. I hope I don’t make a lot of wrong turns at $6/gallon. I heard before I left that we should visit the aquarium to see the sea dragons. I have never heard of sea dragons so I just had to check out what these little sea creatures were. The hardest part of the decision was to pay $33.50 to go to an aquarium. For that price I better see some awesome sea creatures. I would say the first two things you see are worth the price. 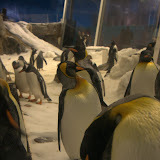 They had king penguins from Antarctica that were very cute. They fill their area with snow twice a day and it doesn’t stay white for long. I learned that a penguin poops every 17 minutes. After the penguin exhibit you see the leafy sea dragon and weedy sea dragons. The weedy sea dragon just had babies successfully for only the second time in captivity. 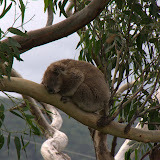 These animals are native to Australia. The weedy sea dragons are actually hard to tell they are an animal because they just look like a weed. I was happy to watch them for awhile next to a couple of Germans. I had the best of both worlds. I got to listen to German and watch a funny sea creature. The rest of the animals were okay. I had to take all my photos through glass so it was pretty difficult to get some good photos. The frogs were pretty cute. Hope you can see the animals good through glass in the slide show below.